This article is about the railway company that existed from 1833 to 1948. For the current train operating company, see Great Western Railway (train operating company). For the railway line, see Great Western Main Line. 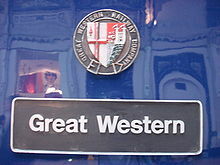 For other uses, see Great Western Railway (disambiguation). The Great Western Railway (GWR) was a British railway company that linked London with the south-west and west of England, the West Midlands, and most of Wales. It was founded in 1833, received its enabling Act of Parliament on 31 August 1835 and ran its first trains in 1838. It was engineered by Isambard Kingdom Brunel, who chose a broad gauge of 7 ft (2,134 mm)—later slightly widened to 7 ft 1⁄4 in (2,140 mm)—but, from 1854, a series of amalgamations saw it also operate 4 ft 8 1⁄2 in (1,435 mm) standard-gauge trains; the last broad-gauge services were operated in 1892. The GWR was the only company to keep its identity through the Railways Act 1921, which amalgamated it with the remaining independent railways within its territory, and it was finally merged at the end of 1947 when it was nationalised and became the Western Region of British Railways. Mileage shown as at end of year stated. The GWR was called by some "God's Wonderful Railway" and by others the "Great Way Round" but it was famed as the "Holiday Line", taking many people to English and Bristol Channel resorts in the West Country as well as the far south-west of England such as Torquay in Devon, Minehead in Somerset, and Newquay and St Ives in Cornwall. The company's locomotives, many of which were built in the company's workshops at Swindon, were painted a Brunswick green colour while, for most of its existence, it used a two-tone "chocolate and cream" livery for its passenger coaches. Goods wagons were painted red but this was later changed to mid-grey. Great Western trains included long-distance express services such as the Flying Dutchman, the Cornish Riviera Express and the Cheltenham Spa Express. It also operated many suburban and rural services, some operated by steam railmotors or autotrains. The company pioneered the use of larger, more economic goods wagons than were usual in Britain. It operated a network of road motor (bus) routes, was a part of the Railway Air Services, and owned ships, docks and hotels. The interior of Brunel's train-shed at Temple Meads, the first Bristol terminus of the GWR, from an engraving by J. C. Bourne. The Great Western Railway originated from the desire of Bristol merchants to maintain their city as the second port of the country and the chief one for American trade. The increase in the size of ships and the gradual silting of the River Avon had made Liverpool an increasingly attractive port, and with a Liverpool to London rail line under construction in the 1830s Bristol's status was threatened. The answer for Bristol was, with the co-operation of London interests, to build a line of their own; a railway built to unprecedented standards of excellence to out-perform the lines being constructed to the North West of England. 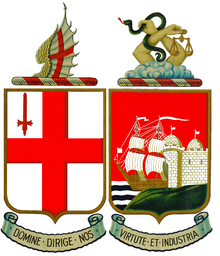 The company was founded at a public meeting in Bristol in 1833 and was incorporated by Act of Parliament in 1835. Isambard Kingdom Brunel, then aged twenty-nine, was appointed engineer. This was by far Brunel's largest contract to date. He made two controversial decisions. Firstly, he chose to use a broad gauge of 7 ft (2,134 mm) to allow for the possibility of large wheels outside the bodies of the rolling stock which could give smoother running at high speeds. Secondly, he selected a route, north of the Marlborough Downs, which had no significant towns but which offered potential connections to Oxford and Gloucester. This meant the line was not direct from to London to Bristol. From Reading heading west, the line would curve in a northerly sweep back to Bath. Brunel surveyed the entire length of the route between London and Bristol himself, with the help of many, including his solicitor Jeremiah Osborne of Bristol law firm Osborne Clarke who on one occasion rowed Brunel down the River Avon himself to survey the bank of the river for the route. George Thomas Clark played an important role as an engineer on the project, reputedly taking the management of two divisions of the route including bridges over the River Thames at Lower Basildon and Moulsford and of Paddington Station. Involvement in major earth-moving works seems to have fed Clark's interest in geology and archaeology and he, anonymously, authored two guidebooks on the railway: one illustrated with lithographs by John Cooke Bourne; the other, a critique of Brunel's methods and the broad gauge. The first 22 1⁄2 miles (36 km) of line, from Paddington station in London to Maidenhead Bridge station, opened on 4 June 1838. When Maidenhead Railway Bridge was ready the line was extended to Twyford on 1 July 1839 and then through the deep Sonning Cutting to Reading on 30 March 1840. The cutting was the scene of a railway disaster two years later when a goods train ran into a landslip; ten passengers who were travelling in open trucks were killed. This accident prompted Parliament to pass the 1844 Railway Regulation Act requiring railway companies to provide better carriages for passengers. The next section, from Reading to Steventon crossed the Thames twice and opened for traffic on 1 June 1840. A 7 1⁄4-mile (12 km) extension took the line to Faringdon Road on 20 July 1840. Meanwhile, work had started at the Bristol end of the line, where the 11 1⁄2-mile (19 km) section to Bath opened on 31 August 1840. Route of the Great Western Railway on Cheffin's Map, 1850. The sweep to the north from Reading is clearly seen. On 17 December 1840, the line from London reached a temporary terminus at Wootton Bassett Road west of Swindon and 80.25 miles (129 km) from Paddington. The section from Wootton Bassett Road to Chippenham was opened on 31 May 1841, as was Swindon Junction station where the Cheltenham and Great Western Union Railway (C&GWUR) to Cirencester connected. That was an independent line worked by the GWR, as was the Bristol and Exeter Railway (B&ER), the first section of which from Bristol to Bridgwater was opened on 14 June 1841. The GWR main line remained incomplete during the construction of the 1-mile-1,452-yard (2.94 km) Box Tunnel, which was ready for trains on 30 June 1841, after which trains ran the 152 miles (245 km) from Paddington through to Bridgwater. In 1851, the GWR purchased the Kennet and Avon Canal, which was a competing carrier between London, Reading, Bath and Bristol. The GWR was closely involved with the C&GWUR and the B&ER and with several other broad-gauge railways. The South Devon Railway was completed in 1849, extending the broad gauge to Plymouth, whence the Cornwall Railway took it over the Royal Albert Bridge and into Cornwall in 1859 and, in 1867, it reached Penzance over the West Cornwall Railway which originally had been laid with the 4 ft 8 1⁄2 in (1,435 mm) standard gauge or "narrow gauge" as it was known at the time. The South Wales Railway had opened between Chepstow and Swansea in 1850 and became connected to the GWR by Brunel's Chepstow Bridge in 1852. It was completed to Neyland in 1856, where a transatlantic port was established. There was initially no direct line from London to Wales as the tidal River Severn was too wide to cross. Trains instead had to follow a lengthy route via Gloucester, where the river was narrow enough to be crossed by a bridge. Work on the Severn Tunnel had begun in 1873, but unexpected underwater springs delayed the work and prevented its opening until 1886. Brunel had devised a 7 ft (2,134 mm) track gauge for his railways in 1835. He later added 1⁄4 inch (6.4 mm), probably to reduce friction of the wheel sets in curves. This became the 7 ft 1⁄4 in (2,140 mm) broad gauge. Either gauge may be referred to as "Brunel's" gauge. In 1844, the broad-gauge Bristol and Gloucester Railway had opened, but Gloucester was already served by the 4 ft 8 1⁄2 in (1,435 mm) standard gauge lines of the Birmingham and Gloucester Railway. This resulted in a break of gauge that forced all passengers and goods to change trains if travelling between the south-west and the North. This was the beginning of the "gauge war" and led to the appointment by Parliament of a Gauge Commission, which reported in 1846 in favour of standard gauge so the 7-foot gauge was proscribed by law (Regulating the Gauge of Railways Act) except for the south-west of England and Wales where connected to the GWR network. Other railways in Britain were to use standard gauge. In 1846 the Bristol and Gloucester was bought by the Midland Railway and it was converted to standard gauge in 1854, which brought mixed-gauge track to Temple Meads station – this had three rails to allow trains to run on either broad or standard gauge. The GWR extended into the West Midlands in competition with the Midland and the London and North Western Railway. Birmingham was reached through Oxford in 1852 and Wolverhampton in 1854. This was the furthest north that the broad gauge reached. In the same year the Shrewsbury and Birmingham Railway and the Shrewsbury and Chester Railway both amalgamated with the GWR, but these lines were standard gauge, and the GWR's own line north of Oxford had been built with mixed gauge. This mixed gauge was extended southwards from Oxford to Basingstoke at the end of 1856 and so allowed through goods traffic from the north of England to the south coast (via the London and South Western Railway – LSWR) without transshipment. The line to Basingstoke had originally been built by the Berks and Hants Railway as a broad-gauge route in an attempt to keep the standard gauge of the LSWR out of Great Western territory but, in 1857, the GWR and LSWR opened a shared line to Weymouth on the south coast, the GWR route being via Chippenham and a route initially started by the Wilts, Somerset and Weymouth Railway. Further west, the LSWR took over the broad-gauge Exeter and Crediton Railway and North Devon Railway, also the standard-gauge Bodmin and Wadebridge Railway. It was several years before these remote lines were connected with the parent LSWR system and any through traffic to them was handled by the GWR and its associated companies. By now the gauge war was lost and mixed gauge was brought to Paddington in 1861, allowing through passenger trains from London to Chester. The broad-gauge South Wales Railway amalgamated with the GWR in 1862, as did the West Midland Railway, which brought with it the Oxford, Worcester and Wolverhampton Railway, a line that had been conceived as another broad-gauge route to the Midlands but which had been built as standard gauge after several battles, both political and physical. On 1 April 1869, the broad gauge was taken out of use between Oxford and Wolverhampton and from Reading to Basingstoke. In August, the line from Grange Court to Hereford was converted from broad to standard and the whole of the line from Swindon through Gloucester to South Wales was similarly treated in May 1872. In 1874, the mixed gauge was extended along the main line to Chippenham and the line from there to Weymouth was narrowed. The following year saw mixed gauge laid through the Box Tunnel, with the broad gauge now retained only for through services beyond Bristol and on a few branch lines. The Bristol and Exeter Railway amalgamated with the GWR on 1 January 1876. It had already made a start on mixing the gauge on its line, a task completed through to Exeter on 1 March 1876 by the GWR. The station here had been shared with the LSWR since 1862. This rival company had continued to push westwards over its Exeter and Crediton line and arrived in Plymouth later in 1876, which spurred the South Devon Railway to also amalgamate with the Great Western. The Cornwall Railway remained a nominally independent line until 1889, although the GWR held a large number of shares in the company. One final new broad-gauge route was opened on 1 June 1877, the St Ives branch in west Cornwall, although there was also a small extension at Sutton Harbour in Plymouth in 1879. Part of a mixed gauge point remains at Sutton Harbour, one of the few examples of broad gauge trackwork remaining in situ anywhere. Once the GWR was in control of the whole line from London to Penzance, it set about converting the remaining broad-gauge tracks. The last broad-gauge service left Paddington station on Friday, 20 May 1892; the following Monday, trains from Penzance were operated by standard-gauge locomotives. 1900: Stert and Westbury linking the Berks and Hants line with Westbury to create a shorter route to Weymouth for the Channel Islands traffic. 1903: the South Wales and Bristol Direct Railway from Wootton Bassett to link up with the Severn Tunnel. 1904: a diversion of the Cornish Main Line between Saltash and St Germans, eliminating the last wooden viaducts on the main line. 1906: the Langport and Castle Cary Railway to shorten the journey from London to Penzance between Reading and Taunton. 1908: the Birmingham and North Warwickshire which, combined with the Cheltenham and Honeybourne of 1906, offered a new route from Birmingham via Stratford-upon-Avon to south Wales. 1910: the Birmingham Direct Line built jointly with the Great Central Railway to give a shorter route from London to Aynho and the North. 1913: the Swansea District Lines which allowed trains to Fishguard Harbour to avoid Swansea. Fishguard had been opened in an attempt to attract transatlantic liner traffic and provided a better facility for the Anglo-Irish ferries than that at Neyland. 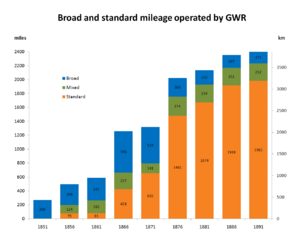 The generally conservative GWR made other improvements in the years before the World War I such as restaurant cars, better conditions for third class passengers, steam heating of trains, and faster express services. These were largely at the initiative of T. I. Allen, the Superintendent of the Line and one of a group of talented senior managers who led the railway into the Edwardian era: Viscount Emlyn (Earl Cawdor, Chairman from 1895 to 1905); Sir Joseph Wilkinson (general manager from 1896 to 1903), his successor, the former chief engineer Sir James Inglis; and George Jackson Churchward (the Chief Mechanical Engineer). It was during this period that the GWR introduced road motor services as an alternative to building new lines in rural areas, and started using steam rail motors to bring cheaper operation to existing branch lines. At the outbreak of World War I in 1914, the GWR was taken into government control, as were most major railways in Britain. Many of its staff joined the armed forces and it was more difficult to build and maintain equipment than in peacetime. After the war, the government considered permanent nationalisation but decided instead on a compulsory amalgamation of the railways into four large groups. The GWR alone preserved its name through the "grouping", under which smaller companies were amalgamated into four main companies in 1922 and 1923. The new Great Western Railway had more routes in Wales, including 295 miles (475 km) of former Cambrian Railways lines and 124 miles (200 km) from the Taff Vale Railway. A few independent lines in its English area of operations were also added, notably the Midland and South Western Junction Railway, a line previously working closely with the Midland Railway but which now gave the GWR a second station at Swindon, along with a line that carried through-traffic from the North via Cheltenham and Andover to Southampton. The 1930s brought hard times but the company remained in fair financial health despite the Depression. The Development (Loans, Guarantees and Grants) Act 1929 allowed the GWR to obtain money in return for stimulating employment and this was used to improve stations including London Paddington, Bristol Temple Meads and Cardiff General; to improve facilities at depots and to lay additional tracks to reduce congestion. The road motor services were transferred to local bus companies in which the GWR took a share but instead, it participated in air services. A legacy of the broad gauge was that trains for some routes could be built slightly wider than was normal in Britain and these included the 1929-built "Super Saloons" used on the boat train services that conveyed transatlantic passengers to London in luxury. When the company celebrated its centenary during 1935, new "Centenary" carriages were built for the Cornish Riviera Express, which again made full use of the wider loading gauge on that route. With the outbreak of World War II in 1939, the GWR returned to direct government control, and by the end of the war a Labour government was in power and again planning to nationalise the railways. After a couple of years trying to recover from the ravages of war, the GWR became the Western Region of British Railways on 1 January 1948. The Great Western Railway Company continued to exist as a legal entity for nearly two more years, being formally wound up on 23 December 1949. GWR designs of locomotives and rolling stock continued to be built for a while and the region maintained its own distinctive character, even painting for a while its stations and express trains in a form of chocolate and cream. About 40 years after nationalisation British Rail was privatised and the old name was revived by Great Western Trains, the train operating company providing passenger services on the old GWR routes to South Wales and the South West, which subsequently became First Great Western as part of the FirstGroup but in September 2015 changed its name to Great Western Railway in order to 'reinstate the ideals of our founder'. The operating infrastructure, however, was transferred to Railtrack and has since passed to Network Rail. These companies have continued to preserve appropriate parts of its stations and bridges so historic GWR structures can still be recognised around the network. The original Great Western Main Line linked London Paddington station with Temple Meads station in Bristol by way of Reading, Didcot, Swindon, Chippenham and Bath. This line was extended westwards through Exeter and Plymouth to reach Truro and Penzance, the most westerly railway station in England. Brunel and Gooch placed the GWR's main locomotive workshops close to the village of Swindon and the locomotives of many trains were changed here in the early years. Up to this point the route had climbed very gradually westwards from London, but from here it changed into one with steeper gradients which, with the primitive locomotives available to Brunel, was better operated by types with smaller wheels better able to climb the hills. These gradients faced both directions, first dropping down through Wootton Bassett to cross the River Avon, then climbing back up through Chippenham to the Box Tunnel before descending once more to regain the River Avon's valley which it followed to Bath and Bristol. Swindon was also the junction for a line that ran north-westwards to Gloucester then south-westwards on the far side of the River Severn to reach Cardiff, Swansea and west Wales. This route was later shortened by the opening of a more direct east–west route through the Severn Tunnel. Another route ran northwards from Didcot to Oxford from where two different routes continued to Wolverhampton, one through Birmingham and the other through Worcester. Beyond Wolverhampton the line continued via Shrewsbury to Chester and Birkenhead; another route via Market Drayton enabled the GWR to reach Crewe. Operating agreements with other companies also allowed GWR trains to run to Manchester. South of the London to Bristol main line were routes from Didcot to Southampton via Newbury, and from Chippenham to Weymouth via Westbury. A network of cross-country routes linked these main lines, and there were also many and varied branch lines. Some were short, such as the 3 1⁄2-mile (5.6 km) Clevedon branch line; others were much longer such as the 23-mile (37 km) Minehead Branch. A few were promoted and built by the GWR to counter competition from other companies, such as the Reading to Basingstoke Line to keep the London and South Western Railway away from Newbury. However, many were built by local companies that then sold their railway to their larger neighbour; examples include the Launceston and Brixham branches. Further variety came from the traffic carried: holidaymakers (St Ives);. royalty (Windsor); or just goods traffic (Carbis Wharf). Brunel envisaged the GWR continuing across the Atlantic Ocean and built the SS Great Western to carry the railway's passengers from Bristol to New York. Most traffic for North America soon switched to the larger port of Liverpool (in LNWR territory) but some transatlantic passengers were landed at Plymouth and conveyed to London by special train. Great Western ships linked Great Britain with Ireland, the Channel Islands and France. The railway's headquarters were established at Paddington station. Its locomotives and rolling stock were built and maintained at Swindon Works but other workshops were acquired as it amalgamated with other railways, including the Shrewsbury companies' Stafford Road works at Wolverhampton, and the South Devon's workshops at Newton Abbot. Worcester Carriage Works was created by flattening land north of Worcester Shrub Hill Station, Reading Signal Works was established in buildings to the north of Reading railway station, and in later years a concrete manufacturing depot was established at Taunton where items ranging from track components to bridges were cast. More than 150 years after its creation, the original main line has been described by an historian as one of the masterpieces of railway design. Working westwards from Paddington, the line crosses the valley of the River Brent on Wharncliffe Viaduct and the River Thames on Maidenhead Railway Bridge, which at the time of construction was the largest span achieved by a brick arch bridge. The line then continues through Sonning Cutting before reaching Reading after which it crosses the Thames twice more, on Gatehampton and Moulsford bridges. Between Chippenham and Bath is Box Tunnel, the longest railway tunnel driven by that time. Several years later, the railway opened the even longer Severn Tunnel to carry a new line between England and Wales beneath the River Severn. Some other notable structures were added when smaller companies were amalgamated into the GWR. These include the South Devon Railway sea wall, the Cornwall Railway's Royal Albert Bridge, and Barmouth Bridge on the Cambrian Railways. In the early years the GWR was managed by two committees, one in Bristol and one in London. They soon combined as a single board of directors which met in offices at Paddington. The Board was led by a chairman and supported by a Secretary and other "officers". The first Locomotive Superintendent was Daniel Gooch, although from 1915 the title was changed to Chief Mechanical Engineer. The first Goods Manager was appointed in 1850 and from 1857 this position was filled by James Grierson until 1863 when he became the first general manager. In 1864 the post of Superintendent of the Line was created to oversee the running of the trains. Passenger numbers exclude season ticket journeys. Early trains offered passengers a choice of first- or second-class carriages. In 1840 this choice was extended: passengers could be conveyed by the slow goods trains in what became third-class. The 1844 Railway Regulation Act made it a legal requirement that the GWR, along with all other British railways, had to serve each station with trains which included third-class accommodation at a fare of not more than one penny per mile and a speed of at least 12 mph (19 km/h). By 1882, third-class carriages were attached to all trains except for the fastest expresses. Another parliamentary order meant that trains began to include smoking carriages from 1868. Special "excursion" cheap-day tickets were first issued in May 1849 and season tickets in 1851. Until 1869 most revenue came from second-class passengers but the volume of third-class passengers grew to the extent that second-class facilities were withdrawn in 1912. The Cheap Trains Act 1883 resulted in the provision of workmen's trains at special low fares at certain times of the day. The principal express services were often given nicknames by railwaymen but these names later appeared officially in timetables, on headboards carried on the locomotive, and on roofboards above the windows of the carriages. For instance, the late-morning Flying Dutchman express between London and Exeter was named after the winning horse of the Derby and St Ledger races in 1849. Although withdrawn at the end of 1867, the name was revived in 1869 – following a request from the Bristol and Exeter Railway – and the train ran through to Plymouth. An afternoon express was instigated on the same route in June 1879 and became known as The Zulu. A third West Country express was introduced in 1890, running to and from Penzance as The Cornishman. A new service, the Cornish Riviera Express ran between London and Penzance – non-stop to Plymouth – from 1 July 1904, although it ran only in the summer during 1904 and 1905 before becoming a permanent feature of the timetable in 1906. 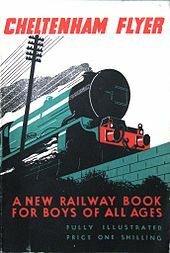 The Cheltenham Flyer was a GWR 'book for boys of all ages'. The Cheltenham Spa Express was the fastest train in the world when it was scheduled to cover the 77.25 miles (124.3 km) between Swindon and London at an average of 71.3 miles per hour (114.7 km/h). The train was nicknamed the 'Cheltenham Flyer' and featured in one of the GWR's 'Books for boys of all ages'. Other named trains included The Bristolian, running between London and Bristol from 1935, and the Torbay Express, which ran between London and Kingswear. Many of these fast expresses included special coaches that could be detached as they passed through stations without stopping, a guard riding in the coach to uncouple it from the main train and bring it to a stop at the correct position. The first such "slip coach" was detached from the Flying Dutchman at Bridgwater in 1869. The company's first sleeping cars were operated between Paddington and Plymouth in 1877. Then on 1 October 1892 its first corridor train ran from Paddington to Birkenhead, and the following year saw the first trains heated by steam that was passed through the train in a pipe from the locomotive. May 1896 saw the introduction of first-class restaurant cars and the service was extended to all classes in 1903. Sleeping cars for third-class passengers were available from 1928. Self-propelled "steam railmotors" were first used on 12 October 1903 between Stonehouse and Chalford; within five years 100 had been constructed. These trains had special retractable steps that could be used at stations with lower platforms than was usual in England. The railmotors proved so successful on many routes that they had to be supplemented by trailer cars with driving controls, the first of which entered service at the end of 1904. From the following year a number of small locomotives were fitted so that they could work with these trailers, the combined sets becoming known as "autotrains" and eventually replacing the steam rail motors. Diesel railcars were introduced in 1934. Some railcars were fully streamlined, some had buffet counters for long-distance services, and others were purely for parcels services. Tonnage for 1850 is approximate. Passenger traffic was the main source of revenue for the GWR when it first opened but goods were also carried in separate trains. It was not until the coal-mining and industrial districts of Wales and the Midlands were reached that goods traffic became significant; in 1856 the Ruabon Coal Company signed an agreement with the GWR to transport coal to London at special rates which nonetheless was worth at least £40,000 each year to the railway. As locomotives increased in size so did the length of goods trains, from 40 to as many as 100 four-wheeled wagons, although the gradient of the line often limited this. While typical goods wagons could carry 8, 10 or (later) 12 tons, the load placed into a wagon could be as little as 1 ton. The many smaller consignments were sent to a local transhipment centre where they were re-sorted into larger loads for the main segment of their journey. There were more than 550 "station truck" workings running on timetabled goods trains carrying small consignments to and from specified stations, and 200 "pick up" trucks that collected small loads from groups of stations. The GWR provided special wagons, handling equipment and storage facilities for its largest traffic flows. For example, the coal mines in Wales sent much of their coal to the docks along the coast, many of which were owned and equipped by the railway, as were some in Cornwall that exported most of the china clay production of that county. The wagons provided for both these traffic flows (both those owned by the GWR and the mining companies) were fitted with end doors that allowed their loads to be tipped straight into the ships' holds using wagon-tipping equipment on the dockside. Special wagons were produced for many other different commodities such as gunpowder, aeroplanes, milk, fruit and fish. Heavy traffic was carried from the agricultural and fishing areas in the south west of England, often in fast "perishables" trains, for instance more than 3,500 cattle were sent from Grampound Road in the 12 months to June 1869, and in 1876 nearly than 17,000 tons of fish was carried from west Cornwall to London. The perishables trains running in the nineteenth century used wagons built to the same standards as passenger coaches, with vacuum brakes and large wheels to allow fast running. Ordinary goods trains on the GWR, as on all other British railways at the time, had wheels close together (around 9 feet (2.7 m) apart), smaller wheels and only hand brakes. In 1905 the GWR ran its first vacuum-braked general goods train between London and Bristol using newly built goods wagons with small wheels but vacuum brakes. This was followed by other services to create a network of fast trains between the major centres of production and population that were scheduled to run at speeds averaging 35 mph (56 km/h). Other railway companies also followed the GWR's lead by providing their own vacuum-braked (or "fitted") services. A number of canals, such as the Kennet and Avon Canal and the Stratford-upon-Avon Canal, became the property of the railway when they were purchased to remove competition or objectors to proposed new lines. Most of these continued to be operated although they were only a small part of the railway company's business: in 1929 the canals took £16,278 of receipts while freight trains earned over £17 million. (£972,000 and £1.02 billion respectively in 2018). The Railways Act 1921 brought most of the large coal-exporting docks in South Wales into the GWR's ownership, such as those at Cardiff, Barry, and Swansea. They were added to a small number of docks along the south coast of England which the company already owned, to make it the largest docks operator in the world. Powers were granted by Parliament for the GWR to operate ships in 1871. The following year the company took over the ships operated by Ford and Jackson on the route between Neyland in Wales and Waterford in Ireland. The Welsh terminal was relocated to Fishguard Harbour when the railway was opened to there in 1906. Services were also operated between Weymouth Quay and the Channel Islands from 1889 on the former Weymouth and Channel Islands Steam Packet Company routes. Smaller GWR vessels were also used as tenders at Plymouth Great Western Docks and, until the Severn Tunnel opened, on the River Severn crossing of the Bristol and South Wales Union Railway. 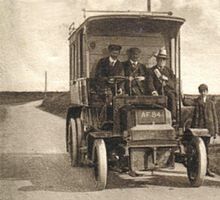 The first railway-operated bus services were started by the GWR between Helston railway station and The Lizard on 17 August 1903. Known by the company as "road motors", these chocolate-and-cream buses operated throughout the company's territory on railway feeder services and excursions until the 1930s when they were transferred to local bus companies (in most of which the GWR held a share). The GWR inaugurated the first railway air service between Cardiff, Torquay and Plymouth in association with Imperial Airways. This grew to become part of the Railway Air Services. The GWR's first locomotives were specified by Isambard Kingdom Brunel but proved unsatisfactory. Daniel Gooch, who was just 20 years old, was soon appointed as the railway's Locomotive Superintendent and set about establishing a reliable fleet. He bought two locomotives from Robert Stephenson and Company which proved more successful than Brunel's, and then designed a series of standardised locomotives. From 1846 these could be built at the company's newly established railway workshops at Swindon. He designed several different 7 ft (2,134 mm) broad-gauge types for the growing railway, such as the Firefly 2-2-2s and later Iron Duke Class 4-2-2s. In 1864 Gooch was succeeded by Joseph Armstrong who brought his standard-gauge experience to the railway. Some of Armstrong's designs were built as either broad or standard gauge just by fitting different wheels; those needing tenders were given old ones from withdrawn broad-gauge locomotives. Joseph Armstrong's early death in 1877 meant that the next phase of motive power design was the responsibility of William Dean who developed express 4-4-0 types rather than the single-driver 2-2-2s and 4-2-2s that had hauled fast trains up to that time. Dean retired in 1902 to be replaced by George Jackson Churchward, who introduced the familiar 4-6-0 locomotives. It was during Churchward's tenure that the term "Locomotive Superintendent" was changed to "Chief Mechanical Engineer" (CME). Charles Collett succeeded Churchward in 1921. He was soon responsible for the much larger fleet that the GWR operated following the Railways Act 1921 mergers. He set about replacing the older and less numerous classes, and rebuilding the remainder using as many standardised GWR components as possible. He also produced many new designs using standard parts, such as the Castle and King classes. The final CME was Frederick Hawksworth who took control in 1941, seeing the railway through wartime shortages and producing GWR-design locomotives until after nationalisation. Brunel and Gooch both gave their locomotives names to identify them, but the standard-gauge companies that became a part of the GWR used numbers. Until 1864 the GWR therefore had named broad-gauge locomotives and numbered standard-gauge ones. From the time of Armstrong's arrival all new locomotives – both broad and standard – were given numbers, including broad-gauge ones that had previously carried names when they were acquired from other railways. Dean introduced a policy in 1895 of giving passenger tender locomotives both numbers and names. Each batch was given names with a distinctive theme, for example kings for the 6000 class and castles for the 4073 class. The GWR first painted its locomotives a dark holly green but this was changed to middle chrome or Brunswick green for most of its existence. They initially had chocolate brown or Indian red frames but this was changed in the twentieth century to black. Name and number plates were generally of polished brass with a black background, and chimneys often had copper rims or "caps". GWR passenger coaches were many and varied, ranging from four- and six-wheeled vehicles on the original broad-gauge line of 1838, through to bogie coaches up to 70 feet (21 m) long which were in service through to 1947 and beyond. Vacuum brakes, bogies and through-corridors all came into use during the nineteenth century, and in 1900 the first electrically lit coaches were put into service. The 1920s saw some vehicles fitted with automatic couplings and steel bodies. Early vehicles were built by a number of independent companies, but in 1844 the railway started to build carriages at Swindon railway works, which eventually provided most of the railway's rolling stock. Special vehicles included sleeping cars, restaurant cars and slip coaches. Passengers were also carried in railmotors, autotrains, and diesel railcars. Passenger-rated vans carried parcels, horses, and milk at express speeds. Representative examples of these carriages survive in service today on various Heritage railways up and down the country. Most coaches were generally painted in variations of a chocolate-brown and cream livery, however they were plain brown or red until 1864 and from 1908 to 1922. Parcels vans and similar vehicles were seldom painted in the two-colour livery, being plain brown or red instead, which caused them to be known as "brown vehicles". 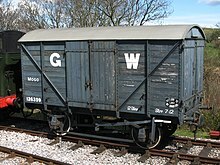 A GWR goods van in the grey livery used from about 1904. This one has end doors to allow motor cars to be loaded. In the early years of the GWR its wagons were painted brown, but this changed to red before the end of the broad gauge. The familiar dark grey livery was introduced about 1904. Most early wagons were four-wheeled open vehicles, although a few six-wheeled vehicles were provided for special loads. Covered vans followed, initially for carrying cattle but later for both general and vulnerable goods too. The first bogie wagons appeared in 1873 for heavy loads, but bogie coal wagons were built in 1904 following on from the large four-wheel coal wagons that had first appeared in 1898. Rated at 20 tons (20.3 tonnes) these were twice the size of typical wagons of the period, but it was not until 1923 that the company invested heavily in coal wagons of this size and the infrastructure necessary for their unloading at their docks; these were known as "Felix Pole" wagons after the GWR's general manager who promoted their use. Container wagons appeared in 1931 and special vans for motor cars in 1933. When the GWR was opened no trains in the United Kingdom were fitted with vacuum brakes, instead handbrakes were fitted to individual wagons and trains also conveyed brake vans where a guard had control of a screw-operated brake. The first goods wagons to be fitted with vacuum brakes were those that ran in passenger trains carrying perishable goods such as fish. Some ballast hoppers were given vacuum brakes in December 1903, and general goods wagons were constructed with them from 1904 onwards, although unfitted wagons (those without vacuum brakes) still formed the majority of the fleet in 1948 when the railway was nationalised to become a part of British Railways. All wagons for public traffic had a code name that was used in telegraphic messages. As this was usually painted onto the wagon it is common to see them referred to by these names, such as "Mink" (a van), "Mica" (refrigerated van), "Crocodile" (boiler truck), and "Toad" (brake van). For the permanent way Brunel decided to use a light bridge rail continuously supported on thick timber baulks, known as "baulk road". Thinner timber transoms were used to keep the baulks the correct distance apart. This produced a smoother track and the whole assembly proved cheaper than using conventional sleepers for broad-gauge track, although this advantage was lost with standard- or mixed-gauge lines because of the higher ratio of timber to length of line. More conventional track forms were later used, although baulk road could still be seen in sidings in the first half of the twentieth century. Brunel developed a system of "disc and crossbar" signals to control train movements, but the people operating them could only assume that each train reached the next signal without stopping unexpectedly. The world's first commercial telegraph line was installed along the 13 miles (21 km) from Paddington to West Drayton and came into operation on 9 April 1839. This later spread throughout the system and allowed stations to use telegraphic messages to tell the people operating the signals when each train arrived safely. A long list of code words were developed to help make messages both quick to send and clear in meaning. More conventional semaphore signals replaced the discs and crossbars over time. 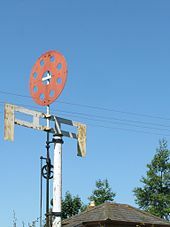 The GWR persisted with the lower quadrant form, where a "proceed" aspect is indicated by lowering the signal arm, despite other British railways changing to an upper quadrant form. Electric light signals of the "searchlight" pattern were later introduced at busy stations; these could show the same red/green or yellow/green aspects that semaphore signals showed at night. An "automatic train control" system was introduced from 1906 which was a safety system that applied a train's brakes if it passed a danger signal. The GWR is known admiringly to some as "God's Wonderful Railway", but jocularly to others as the "Great Way Round" as some of its earliest routes were not the most direct. 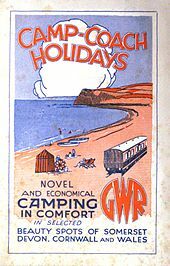 The railway, however, promoted itself from 1908 as "The Holiday Line" as it carried huge numbers of people to resorts in Wales and south-west England. Cheap tickets were offered and excursion trains operated to popular destinations and special events such as the 1851 Great Exhibition. Later, GWR road motors operated tours to popular destinations not served directly by train, and its ships offered cruises from places such as Plymouth. Redundant carriages were converted to camp coaches and placed at country or seaside stations such as Blue Anchor and Marazion and hired to holidaymakers who arrived by train. The GWR had operated hotels at major stations and junctions since the early days, but in 1877 it opened its first "country house hotel", the Tregenna Castle in St Ives, Cornwall. It later added the Fishguard Bay Hotel in Wales and the Manor House at Moretonhampstead, Devon, to which it added a golf course in 1930. It promoted itself from 1908 as "The Holiday Line through a series of posters, postcards, jigsaw puzzles, and books. These included Holiday Haunts, describing the attraction of the different parts of the GWR system, and regional titles such as S. P. B. Mais's Cornish Riviera and A. M. Bradley's South Wales: The Country of Castles. Guidebooks described the scenery seen Through the Window of their trains. Other GWR books were designed to encourage an interest in the GWR itself. Published as "Books for Boys of All Ages", these included The 10:30 Limited and Loco's of the Royal Road. 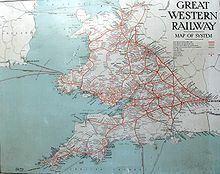 The Great Western Railway effectively created the modern day tourist spots of the West Country and the southwest part of Wales that had previously been very difficult to reach. The Bristol Channel resorts of Wales and the West Country such as Minehead or the cliffs of Exmoor had been very remote from other parts of England before the advent of the GWR. Rain, Steam and Speed - The Great Western Railway, by Turner. The GWR attracted the attention of the artists from an early date. John Cooke Bourne's History and Description of the Great Western Railway was published in 1846 and contained a series of detailed lithographs of the railway that give readers a glimpse of what the line looked like in the days before photography. J. M. W. Turner painted his Rain, Steam and Speed - The Great Western Railway in 1844 after looking out of the window of his train on Maidenhead Railway Bridge, and in 1862 William Powell Frith painted The Railway Station, a large crowd scene on the platform at Paddington. The station itself was initially painted for Powell by W Scott Morton, an architect, and a train was specially provided by the GWR for the painting, in front of which a variety of travellers and railway staff form an animated focal point. The GWR has featured in many television programmes, such as the BBC children's drama series God's Wonderful Railway in 1980. It was also immortalised in Bob Godfrey's animated film Great, which won the Academy Award for Best Animated Short Film of 1975 which tells the story of Brunel's engineering accomplishments. Me very sorry for my sins. The GWR's memory is kept alive by several museums such as STEAM – the museum of the GWR (in the old Swindon railway works), and the Didcot Railway Centre, where there is an operating broad-gauge train. Preserved GWR lines include those from Totnes to Buckfastleigh, Paignton to Kingswear, Bishops Lydeard to Minehead, Kidderminster to Bridgnorth and Cheltenham to Broadway. Many other heritage railways and museums also have GWR locomotives or rolling stock in use or on display. Numerous stations owned by Network Rail also continue to display much of their GWR heritage. This is seen not only at the large stations such as Paddington (built 1851, extended 1915) and Temple Meads (1840, 1875 & 1935) but other places such as Bath Spa (1840), Torquay (1878), Penzance (1879), Truro (1897), and Newton Abbot (1927). Many small stations are little changed from when they were opened, as there has been no need to rebuild them to cope with heavier traffic; good examples can be found at Yatton (1841), Frome (1850, Network Rail's last surviving Brunel-style train shed), Bradford-on-Avon (1857), and St Germans (1859). Even where stations have been rebuilt, many fittings such as signs, manhole covers and seats can still be found with "GWR" cast into them. The Great Western Main Line was considered as a potential UNESCO World Heritage Site in 2006 but rejected in 2011. The proposal comprised seven sites: Temple Meads (including Brunel's GWR offices, boardroom, train shed, the B&ER offices, and the bridge over the River Avon); Bath (including the route from Twerton Tunnel to Sydney Gardens); Middlehill and Box Tunnels; the Swindon area including Swindon railway works and village; Maidenhead Railway Bridge; Wharncliffe Viaduct; and Paddington station. Several locomotives have been given the name Great Western. The first was an Iron Duke class broad-gauge locomotive built in 1846, the first locomotive entirely constructed at the company's Swindon locomotive works. This was withdrawn in 1870, but in 1888 a newly built locomotive in the same class was given the same name; this was withdrawn four years later when the broad gauge was taken out of use. A standard-gauge 3031 class locomotive, number 3012, was then given the name. The last GWR locomotive to carry the name was Castle class number 7007, which continued to carry it in British Railways days. The name later reappeared on some BR diesels. The first was 47500 which carried the name from 1979 until 1991. Another Class 47, this time 47815, had the name bestowed on it in 2005; it is currently (2009) in operation with Riviera Trains. A High Speed Train power car, number 43185, also carries the same name; it is currently, and appropriately, a part of the modern Great Western Railway fleet. Locomotive Superintendent to the Shrewsbury and Chester Railway and the Shrewsbury and Birmingham Railways from 1853, he was responsible for the locomotive workshops at Wolverhampton. When they amalgamated with the GWR the following year he was given the title of Northern Division Locomotive Superintendent (1854–1864), he then moved to Swindon as the chief Locomotive Superintendent (1864–1877). Chief Engineer to the GWR (1835–1859) and many of the broad-gauge lines with which it amalgamated, also the standard-gauge Taff Vale Railway. He was responsible for choosing the route of the railway and designing many of today's iconic structures including Box Tunnel, Royal Albert Bridge, Maidenhead Railway Bridge, Paddington and Temple Meads stations. Locomotive Superintendent (1902–1915) and Chief Mechanical Engineer (1915–1921) who instigated much standardisation of locomotive components. The GWR's first Locomotive Superintendent (1837–1864) and its chairman (1865–1889). He was responsible for the railway's early locomotive successes, such as the Iron Duke Class, and for establishing Swindon railway works. Goods Manager (1857–1863), he then became the general manager (1863–1887) from which position he saw the railway through a period of expansion and the early gauge conversions. The last GWR Chief Mechanical Engineer (1941–1947). The general manager (1887–1896) responsible for managing the final gauge conversion in 1892. General manager (1929–1947) who saw the GWR through World War II. As general manager (1921–1929) he oversaw the Grouping of the South Wales railways into the GWR following the Railways Act 1921, and promoted the use of 20 ton wagons to bring efficiencies to the railway's coal trade. The GWR's Telegraph Superintendent (1855–1892) patented the Disc Block Telegraph Instrument that was used to safely control the dispatch of trains. First used on the Metropolitan Railway in 1863 and the Bristol and South Wales Union Railway in 1864, it was later used on many other lines operated by the company. ^ a b c d e "A brief review of the Company's hundred years of business". Great Western Railway Magazine. Great Western Railway. 47 (9): 495–499. 1935. ^ "Brunel 200 – Working With Visionaries" (PDF). ^ James, B, Ll. "Clark, George Thomas (1809–1898)". Oxford Dictionary of National Biography. Oxford University Press. Retrieved 21 August 2007. ^ a b Bourne, John Cooke (1846). History and Description of the Great Western Railway. London: David Bogue. ISBN 0-7153-4688-1. ^ Clark, GT (1895). "The Birth and Growth of the Broad Gauge". Gentleman's Magazine (279): 489–506. ^ a b Walker, Thomas A (2004). The Severn Tunnel: Its Construction and Difficulties (1872–1887). Stroud: Nonsuch Publishing Ltd. ISBN 1-84588-000-5. ^ MacDermot, E.T. (1927). History of the Great Western Railway, vol. I: 1833–1863. Paddington: Great Western Railway. p. 49. In laying the rails an extra quarter of an inch was allowed on the straight, making the gauge 7 ft 1⁄4 in (2,140 mm). strictly speaking, but it was always referred to as 7 feet. ^ Steele, A.K. (1972). Great Western Broad Gauge Album. Headington: Oxford Publishing Company. p. 4. ISBN 0-902888-11-0. ^ Nicholas, John (1992). The North Devon Line. Sparkford: Oxford Publishing Company. pp. 85–91. ISBN 0-86093-461-6. ^ Whetmath, C.F.D. (1967). The Bodmin and Wadebridge Railway (2nd ed.). Teddington: Branch Line Handbooks. pp. 21–28. OCLC 462667. ^ Clinker, C. R. (1978). New light on the Gauge Conversion. Bristol: Avon-Anglia. pp. 15–16. ISBN 0-905466-12-8. ^ a b c d e "Handmaids of the Railway Services". Great Western Railway Magazine. Great Western Railway. 47 (9): 515–516. 1935. ^ Harris, Michael (1985). Great Western Coaches From 1890 (3rd ed.). Newton Abbot: David and Charles. p. 83. ISBN 0-7153-8050-8. ^ "Main-Line Companies Dissolved". The Railway Magazine. London: Transport (1910) Ltd. 96 (586): 73. February 1950. ^ Allen, G. Freeman (1979). The Western Since 1948. Shepperton: Ian Allan. pp. 11–15. ISBN 0-7110-0883-3. ^ Haresnape, Brian (1979). British Rail 1948–78: A Journey by Design. Shepperton: Ian Allan. p. 86. ISBN 0-7110-0982-1. ^ "Changing from First Great Western to GWR". GWR. Great Western Railway. Retrieved 7 January 2016. ^ Time Tables. London: Great Western Railway. 1939. ^ Maggs, Colin G. (1987). The Clevedon Branch. Didcot: Wild Swan Publications. ISBN 0-906867-52-5. ^ Coleby, Ian (2006). The Minehead Branch 1848–1971. Witney: Lightmoor Press. ISBN 1-899889-20-5. ^ Anthony, GH; Jenkins, SC (1997). The Launceston Branch. Headington: Oakwood Press. ISBN 0-85361-491-1. ^ Potts, C.R. (2000) . The Brixham Branch (2nd ed.). Usk: Oakwood Press. ISBN 0-85361-556-X. ^ Jenkins, Stanley C (1992). "the St Ives Branch". Great Western Railway Journal. Wild Swan Publications Ltd (Cornish Special Issue): 2–34. ^ Potts, C.R. (1993). Windsor to Slough : a Royal branch line. Oxford: Oakwood Press. ISBN 0-85361-442-3. ^ Vaughan, John (1991). The Newquay Branch and its Branches. Sparkford: Haynes/Oxford Publishing Company. pp. 108–116. ISBN 0-86093-470-5. ^ Brindle (2006), p. 180. ^ a b Duckworth, Christian Leslie Dyce; Langmuir, Graham Easton (1968). Railway and Other Steamers. Prescot: T Stephenson & Sons. pp. 184–206. ^ a b c d e f g Carver, John (December 2005). "An Introduction to the Great Western Railway". Railway Magazine. IPC Media Ltd. 151 (1256): 8–14. ^ Andrews, Julian (August 1997). "BR's Concrete Works at Taunton". Modelling Railways Illustrated. Model Media Publications. 4 (10): 462–464. ISSN 0969-7349. ^ Brindle, Steven (2006). Brunel: the man who built the world. London: Weidenfeld & Nicolson. p. 268. ISBN 0-297-84408-3. ^ Owen, Professor J.B.B. (1976). "Arch Bridges". In Puglsey, Sir Alfred (ed.). The Works of Isambard Kingdom Brunel. London: Institution of Civil Engineers. pp. 89–106. ISBN 0-7277-0030-8. ^ Chapman, W.G. (1935). Track Topics. London: Great Western Railway. pp. 51–52. ISBN 0-7153-8953-X. ^ Clifford, David (2006). Isambard Kingdom Brunel: The Construction of the Great Western Railway. Reading: Finial Publishing. pp. 129–171. ISBN 1-900467-28-3. ^ Swift, Andrew (2006). The Ringing Grooves of Change. Akeman Press. pp. 215–249. ISBN 0-9546138-5-6. ^ Kay, Peter (1991). Exeter – Newton Abbot: A Railway History. Sheffield: Platform 5 Publishing. pp. 93–108. ISBN 1-872524-42-7. ^ Binding, John (1997). Brunel's Royal Albert Bridge. Truro: Twelveheads Press. ISBN 0-906294-39-8. ^ a b c d e f g "The Chairmen and Principal Officers of the Great Western Railway Company 1833–1935". Great Western Railway Magazine. Great Western Railway. 47 (9): 462. 1935. ^ a b "From ordeal to luxury in railway travel". Great Western Railway Magazine. Great Western Railway. 47 (9): 505–507. 1935. ^ Maggs, Colin (1981). Rail Centres: Bristol. Shepperton: Ian Allan. p. 25. ISBN 0-7110-1153-2. ^ Beck, Keith; Copsey, John (1990). The Great Western in South Devon. Didcot: Wild Swan Publication. p. 119. ISBN 0-906867-90-8. ^ a b Lewis, John (1991). Great Western Auto Trailers, Part One. Didcot: Wild Swan Publications. ISBN 0-906867-99-1. ^ a b Judge, Colin (2008) [Oxford Publishing Company, 1986]. The history of Great Western A.E.C. diesel railcars. Southampton: Noodle Books. ISBN 1-906419-11-6. ^ Atkins (1975), p. 16. ^ a b Atkins, AG; et al. (1975). A History of GWR Goods Wagons, Volume 1. Newton Abbot: David and Charles. ISBN 0-7153-6532-0. ^ Bennett, Alan (1990a) . The Great Western Railway in West Cornwall (2nd ed.). Cheltenham: Runpast Publishing. pp. 59–61. ISBN 1-870754-12-3. ^ Sheppard, Geof (2004). "A Cornish cattle census". Broadsheet. Broad Gauge Society (52): 9–10. ^ Sheppard, Geof (2004). "Fish from Cornwall". Broadsheet. Broad Gauge Society (52): 24–29. ^ Atkins (1975), pp. 12–15. ^ "A Brief Review of the Company's Hundred Years of Business". Great Western Railway Magazine. Great Western Railway. 47 (9): 495–500. 1935. ^ Kelley, Philip J. (2002). Great Western Road Vehicles. Hersham: Oxford Publishing Company. pp. 177–220. ISBN 0-86093-568-X. ^ a b Sheppard, Geof (2008). Broad Gauge Locomotives. Southampton: Noodle Books. pp. 9–11. ISBN 1-906419-09-4. ^ a b Hill, Keith (December 2005). "A Colossus of Steam". Railway Magazine. IPC Media Ltd. 151 (1256): 16–20. ^ Chapman, W G (1936). Loco's of "The Royal Road". London: Great Western Railway. pp. 119–144. ^ Chapman, WG (1938). GWR Engines (14th ed.). London: Great Western Railway. pp. 9–18. ^ Lewis, John; et al. (2009) [Slinn, 1978]. Great Western Way (2nd ed.). Butterley: Historical Model Railway Society. pp. 14–62. ISBN 978-0-902835-27-6. ^ Lewis, John (2004). Great Western Steam Railmotors: and their services. Wild Swan Publications Ltd. ISBN 1-874103-96-8. ^ Jolly, Mike (1981). "Carriage and Waggon Livery c1855". Broadsheet. Broad Gauge Society (6): 5–7. ^ Lewis, John (2001). "The Colour of GWR Goods Wagons". Broadsheet. Broad Gauge Society (45): 4–5. ^ Atkins (1975), pp. 67–80. ^ Vaughan, John (1984) . A Pictorial Record of Great Western Signalling. Poole: Oxford Publishing Company. ISBN 0-86093-346-6. ^ Morris, S (7 July 2006). "Wonderful Railway on track to be world heritage site". London: Guardian Unlimited. Retrieved 19 May 2007. ^ Leigh, Chris (1988). Railway World Special: Cornish Riviera. Shepperton: Ian Allan. p. 8. ISBN 0-7110-1797-2. ^ Bennett, Alan (1988b). The Great Western Railway in Mid Cornwall. Southampton: Kingfisher Railway Publications. pp. 90–93. ISBN 0-946184-53-4. ^ Bennett, Alan (1993). Great Western Holiday Lines in Devon and West Somerset. Runpast Publications. ISBN 1-870754-25-5. ^ Bennett, Alan (2008). "Wales: A foreign country". Backtrack. Pendragon Publishing. 22 (2): 80–83. ^ Wilson, Roger Burdett (1970). Go Great Western: A History of GWR Publicity. Newton Abbot: David & Charles. pp. 15, 129. ISBN 0-946537-38-0. ^ Bennett, Alan (2008). "Devon: A bold and beautiful prospect". Backtrack. Pendragon. 22 (11): 668–671. ^ Walton, John K. (2000). The British Seaside: Holidays and Resorts in the Twentieth Century. Manchester University Press. p. 74. ISBN 9780719051708. ^ Hamilton Ellis, C (1977). Railway Art. London: Ash and Grant Ltd. p. 18. ISBN 0-904069-10-9. ^ Cowling, Mary (2000). Victorian Figurative Painting. London: Andreas Papadakis. pp. 113–118. ISBN 1-901092-29-1. ^ "God's Wonderful Railway". TV.com. Retrieved 19 November 2008. ^ "Great (1975)". Toonhound. Retrieved 26 January 2009. ^ Delaney, Frank (1983). Betjeman Country. Paladin. p. 155. ^ Brindle, Steven (2004). Paddington Station: its history and architecture. Swindon: English Heritage. pp. 26–49. ISBN 1-873592-70-1. ^ Brindle (2004), pp. 120–121. ^ Oakley, Mike (2002). Bristol Railway Stations 1840–2005. Wimbourne: The Dovecote Press. pp. 13–17. ISBN 1-904349-09-9. ^ Potts, C R (1998). The Newton Abbot to Kingswear Railway (1844–1988). Oxford: Oakwood Press. pp. 74–77. ISBN 0-85361-387-7. ^ Bennett (1988a), p.25 – 32. ^ Bennett (1988a), p. 19–30. ^ Oakley, Mike (2007). Devon Railway Stations. Wimbourne: The Dovecote Press. pp. 143–144. ISBN 978-1-904349-55-6. ^ "The BGS Millennium Project". Broad Gauge Society. 2004. Retrieved 18 August 2008. ^ "The United Kingdom's World Heritage" (PDF). Department for Culture, Media and Sport. March 2011. Retrieved 20 January 2015. ^ a b Pike, Jim (2000). Locomotive Names. Stroud: Sutton Publishing. p. 53. ISBN 0-7509-2284-2. ^ "Number 47500". The 47's. The 47's. 2009. Retrieved 11 March 2009. ^ "Number 47815". The 47's. The 47's. 2009. Retrieved 20 November 2009. ^ "HST Power Car Fleet List" (PDF). 125 Group. 125 Group. Archived from the original (PDF) on 22 July 2013. Retrieved 11 March 2009. ^ a b c d e f g h i j k l m n o p q "Great Western Chairmen". The Great Western Archive. John Daniel. Retrieved 5 April 2017. ^ Brindle, Steven (2006). Brunel: the man who built the world. London: Weidenfeld & Nicolson. ISBN 0-29784-408-3. Adams, William, ed. (1993). Encyclopaedia of the Great Western Railway. Sparkford: Patrick Stephens. ISBN 1-85260-329-1. Ahrons, E.L.; Asher, L.L. (1953). Locomotive and Train Working in the Latter Part of the Nineteenth Century. 4. Cambridge: Heffer. OCLC 606019476. Bryan, Tim (2004). All in a Day's Work: Life on the GWR. Ian Allan. ISBN 0-7110-2964-4. Gibbs, George Henry (1971). Simmons, Jack (ed.). The Birth of the Great Western Railway. Bath: Adams and Dart. ISBN 978-0-239-00088-0. Nock, O.S. (1982) . History of the Great Western Railway. Volume Three: 1923–1947. Ian Allan. ISBN 0-7110-0304-1. Sidney, Samuel (1971) [1846: Edmonds and Vacher]. Extracts form Gauge Evidence 1845. Wakefield: SR Publishers. ISBN 0-85409-723-6. Tourret, R (2003). GWR Engineering Work, 1928–1938. Tourret Publishing. ISBN 0-905878-08-6. Vaughan, Adrian (1985). Grub, Water and Relief: Tales of the Great Western 1835–1892. London: John Murray. ISBN 0-7195-4176-X. Whishaw, Francis (1842). The Railways of Great Britain and Ireland Practically Described and Illustrated (2nd ed.). London: John Weale. pp. 141–162. OCLC 833076248. Rules and Regulations for the Guidance of the Officers and Men. Ian Allan. 1993 [1904 Great Western Railway]. ISBN 0-7110-2259-3.